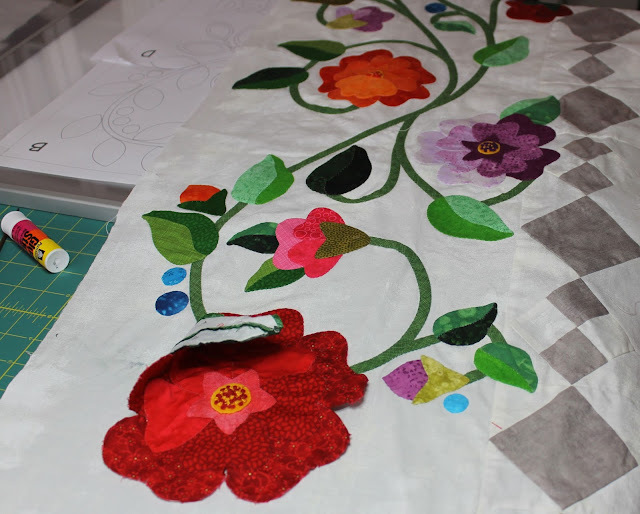 When I first learned to applique (way back in the dark ages), there was a lot about the process I didn't like. There seemed to be a lot of extra steps, making extra work without extra value. I think in another life time I might have been an efficiency engineer. I love the idea of doing my best work with the least amount of effort. Streamlining the process is what has lead me to the technique I call "Hand Applique by Machine" (or, as Craftsy prefers "Machine Finished Hand Applique"). Instead of sewing everything twice (basting), I glue baste, for example. 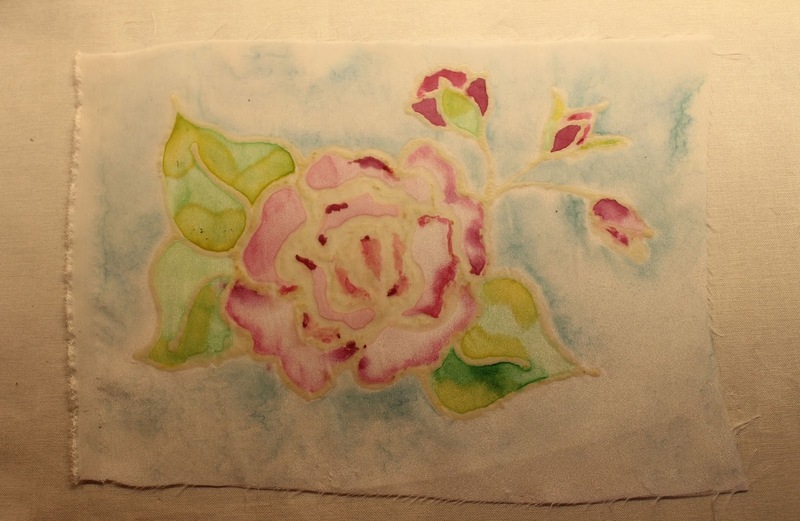 And to avoid the step of removing the freezer paper, I developed Wash Away Applique Sheets. Another tedious, but vital, step in the process is cutting out the templates. I tried to make it quicker by stapling and cutting multiple layers of templates, and that works just fine. But what if we could just send a little file to a machine and hey, presto! perfect templates? 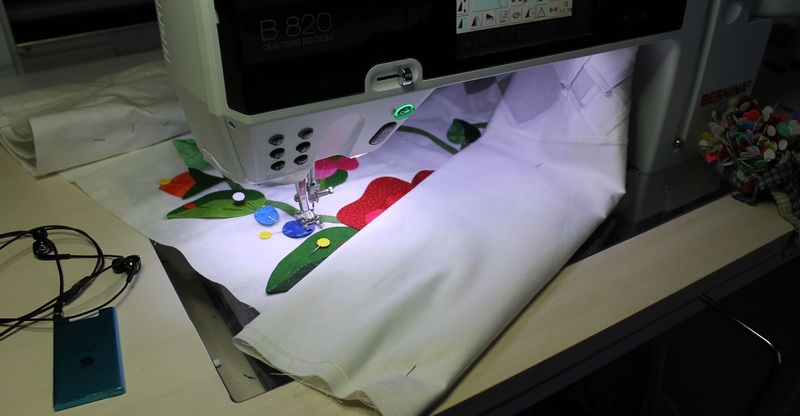 It's just as easy as sending a document to the printer, but this machine spits out applique! I've considered all sorts of die cutting options. The problem with die cutting machines is that the sizes are set, a die for a rose will only ever make a rose that size. But a file for an electronic cutter can be scaled to any size! Look at all those perfect templates, cut from my WAAS. I've been playing with my Silhouette Cameo. I'm learning how to use the design tools, which are really pretty simple. I love that I can make perforated lines for the internal shapes, which will make it very easy to keep the parts of a motif together. 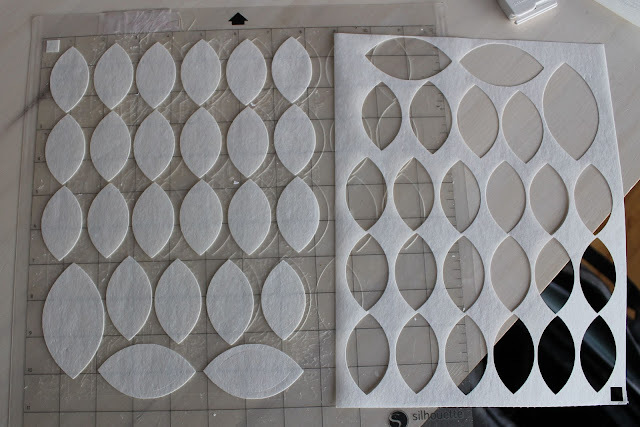 There is also a process for writing on the shapes, which will help in organizing the shapes for a large project. I'll be playing with that next. I'm not completely happy with this project yet. I really don't like my fabric choices, so I'll be reworking it and making it again. 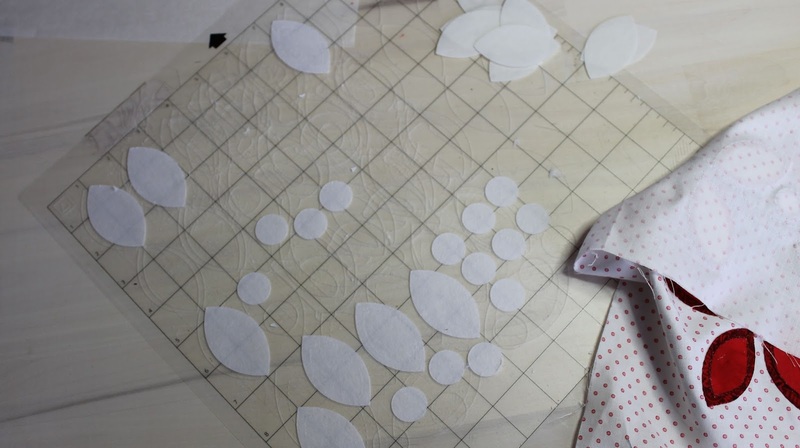 But I am thrilled with the possibilities of easily cutting my applique templates, just look at those perfect circles, imagine being able to make them in any size! 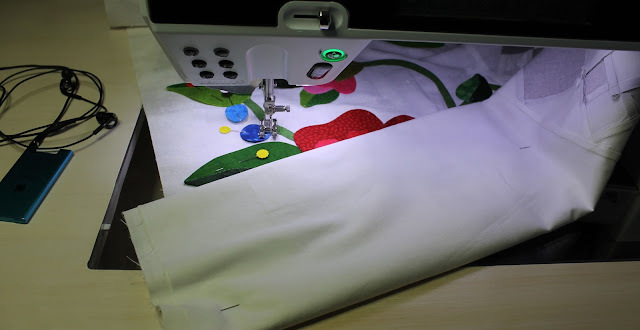 I wonder, though, is this a gadget that applique quilters could love? 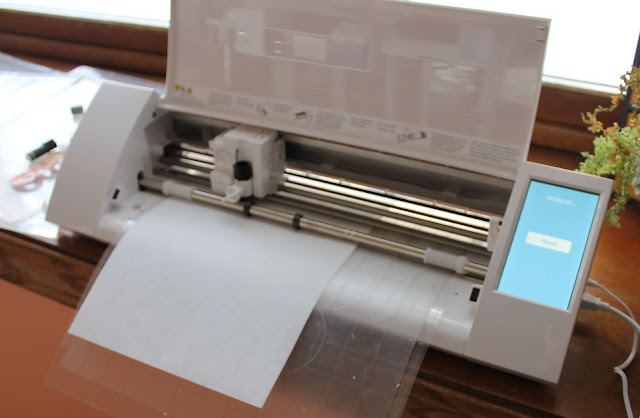 Would you be tempted by a pattern that included a file for an electronic die cutter? I really should know better than to leave a cup of coffee near anything I value. 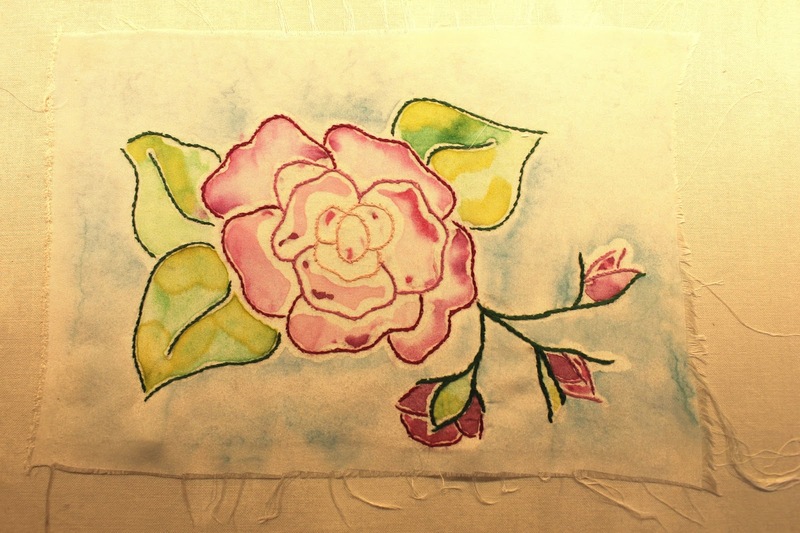 This time it was just a few splatters on the unsewn end of one of the applique borders. It would have been luckier if it had been on the border that isn't sewn yet, but I don't know anyone who plans on being a dork. Most of the coffee washed out, what remains will just add to the subtle variations already in the fabric. Despite my best efforts, washing out the coffee also meant getting part of the applique wet. This half of the center rose was left unstitched, waiting for the remaining applique shapes to be pinned in place. After washing I tossed the border into the dryer. I certainly didn't want to leave it sitting wet, a sure invitation to any colors that might feel like a jog into the background fabric. I had to leave the house, and I didn't want to leave the border all jumbled up in the dryer, especially if it didn't get entirely dry. 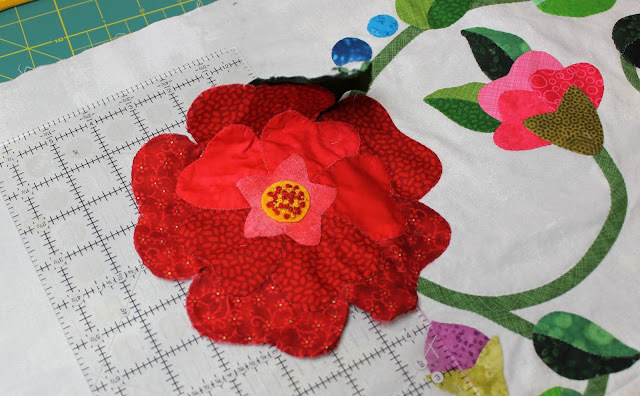 So I spread the border out on the cutting table and slipped a ruler under the applique to protect the background from the slightly damp fabric. The piece got wet enough to release some of the glue basted edges. 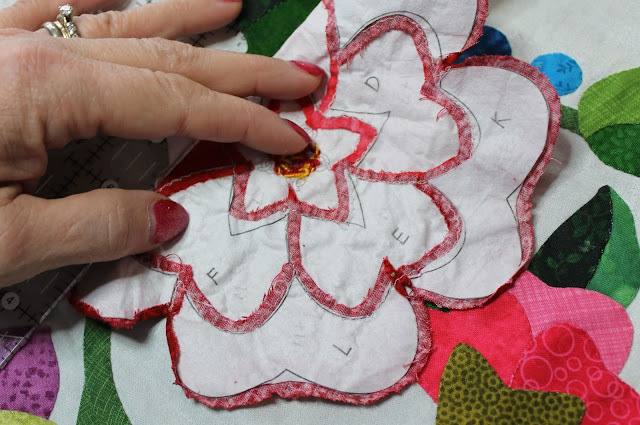 Some of the Wash Away Applique Sheet templates also started to disintegrate, but a little quality time with a glue stick will fix this right up. Disaster averted this time, but somehow I doubt that I've actually learned my lesson. This little rose was my first attempt at painting on silk. I was hooked from the start. I have signed up for two more classes and set up a nice little space in the basement for the delightfully messy stuff. On this piece, I've used clear gutta to define the shapes. Gutta is a resist to contain the flow of the paint to specific areas, acting like a sort of dam to hold back the paint. 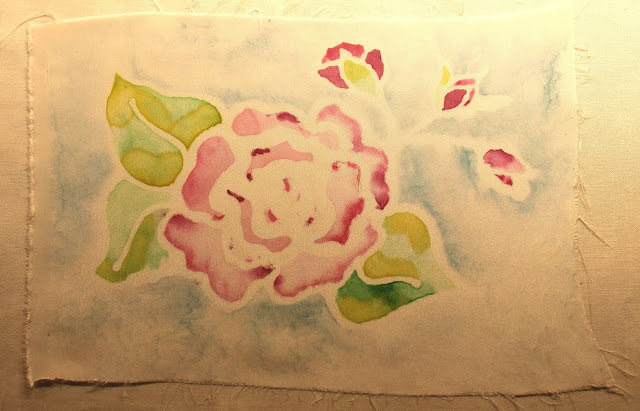 After the gutta was washed out I found that I lost some of the paint with it, especially in the center. I also ended up with white silk showing where the stems were meant to go, which I liked because it just begs for embellishment. Silk is very slippery and thin, so I ironed a hunk of Wash Away Applique Sheet to the wrong side as a stabilizer, and hauled out my box of silk embroidery floss. My first thought was to replace the missing paint in the center with embroidery stitches. Nope. 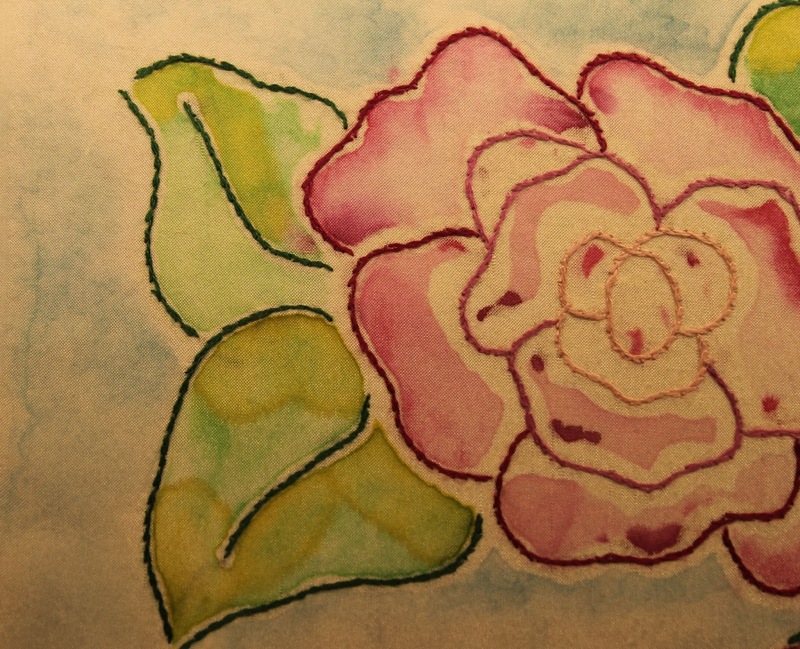 The blending of shades of pink didn't work as hoped. The stitching just looked clunky and forced, so it got picked away. The nice thing about silk is that it's pretty tough and the holes just closed right in. What it needed was a more refined hand. I started in the center of the rose, outlining each petal, using the stitches to replace the lines that the gutta had left. As I worked, though, I felt that perhaps, once again, I was being to literal. As I got to the buds I decided to let the lines be a little more abstract, unfinished, more sketched in than actual outlines. By the time I got to the last leaves I realized that thinner lines would be even better, so I used just two strands of the six stranded floss here. If I were starting over, I think I'd go even finer, something to try next time. Here it is. I love how the leaves look. Best of all, this little slip of a project (it's just about 4 by 6 inches) has left me thinking about how I would do the next one differently. I won't try to fix this any further, I think I've learned all it has to tell me. What a luxury for me, creating these little cast-offs, just little bits of this or that I can use for trying out new ideas. It seems like forever since I've had the time to "waste" on things that may not turn out. Deadlines can do that to you. It's taken me a long time to unwind from the deadline rat race too, to leave behind that feeling that every moment must be productive or I will fail, disappoint or come up short. A feeling that's left me entirely unproductive, paralyzed, feeling guilty and a little lost. Finally I am looking forward to not getting it right the first time. I have entered the joyful land of the do-over. I love everything about winter except for the short days. Well, I love everything about winter that can be enjoyed from the inside looking out. Since my inner child has been playing with matches for years, the colder weather suits me just fine. But the short, dark days take their toll and by Christmas I'm ready to hibernate. While it feels like I can sense every minute of daylight added to the days in January, it takes until the middle of February for me to be convinced that spring truly will come again. And then I begin to come back to life. 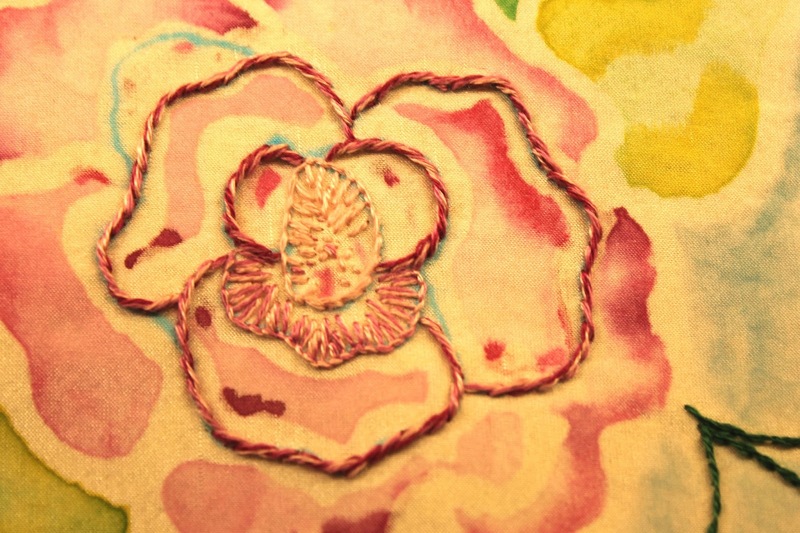 Stitching the long borders on A Fine Romance can be tricky. 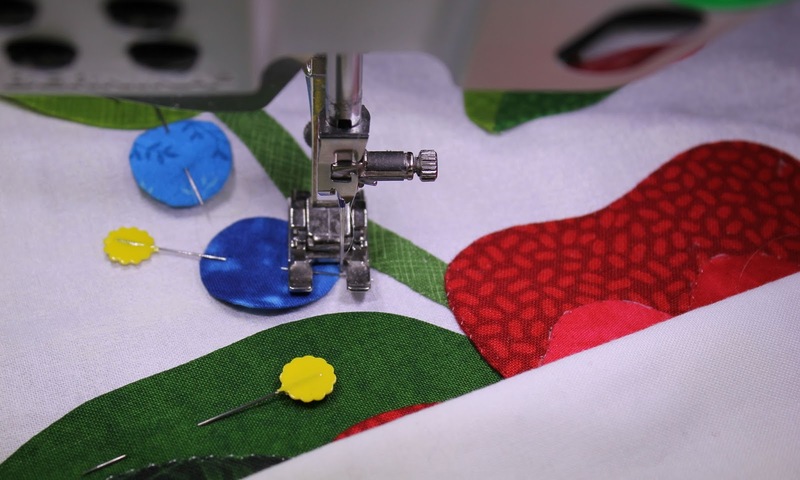 With dozens and dozens of pins holding the applique shapes in place it can be downright painful to do all the twisting and turning needed to stitch down the curvy shapes. After cursing (and bleeding) my way through the side borders I decided to pin just half of the longer top and bottom border shapes in place. 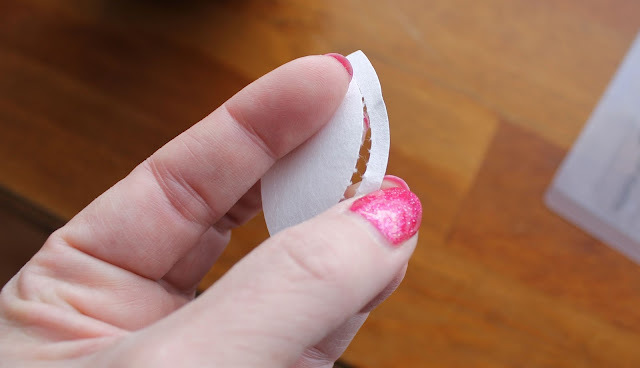 The empty end of the border can be folded up and pinned together to help reduce the bulk. The pinned end (you can see it behind the sewing machine) is rolled up too. It does make it easier to turn the border fabric, but it also stands some of the pins straight up. Ouch. A good book on my iPod helps to pass the time. 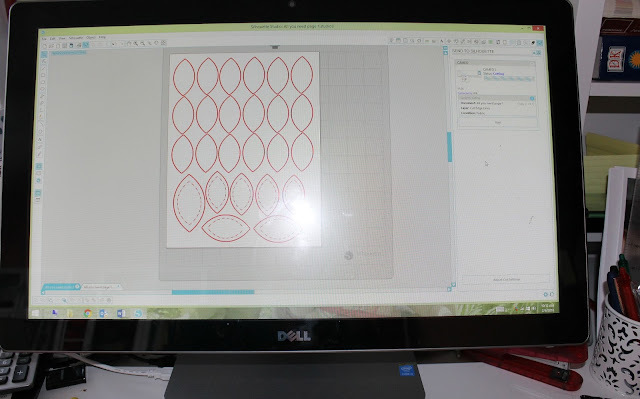 The diagram for the top and bottom borders seems to trail half way across the studio floor, the remaining motifs are spread out on the shorter table. I suspect that I will run out of leaves, I lost count somewhere along the way, and I may need to make a little more bias strips to finish up the vines. 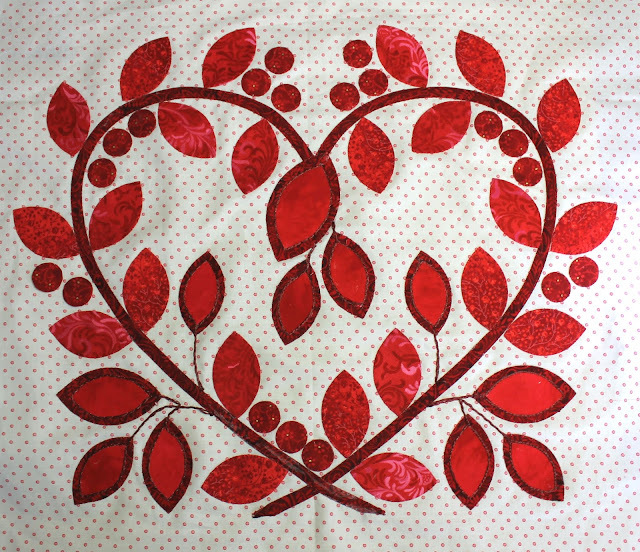 But I've pinned one end of the two remaining borders, and one of those has been stitched down. I've been listening to Alex Berenson's John Wells spy series. I have three more books in the series to go. I wonder if that will be enough to finish the borders. 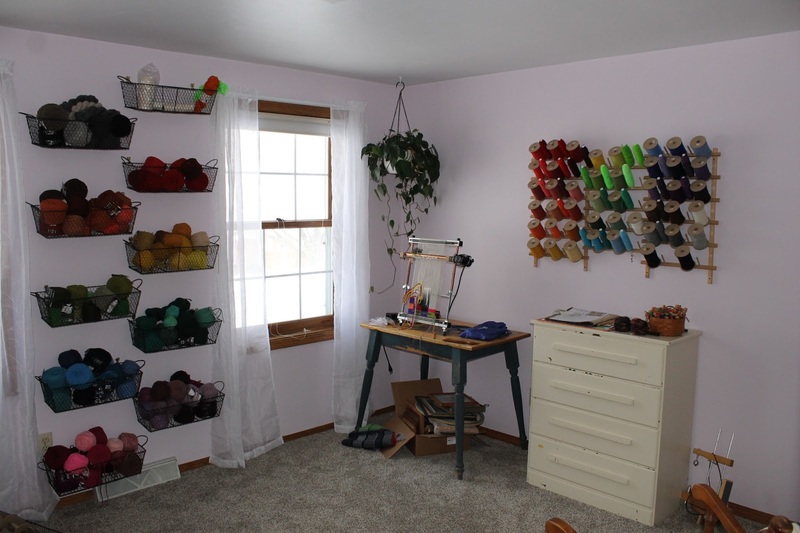 I have taken over yet another room in the house, this time for the yarn stash. This is the smallest bedroom. It was sort of mustard and baby poop brown, which made the room feel very small and close. I painted it Secret Scent by Behr, with a white ceiling. It's a gentle lavender and I love it. 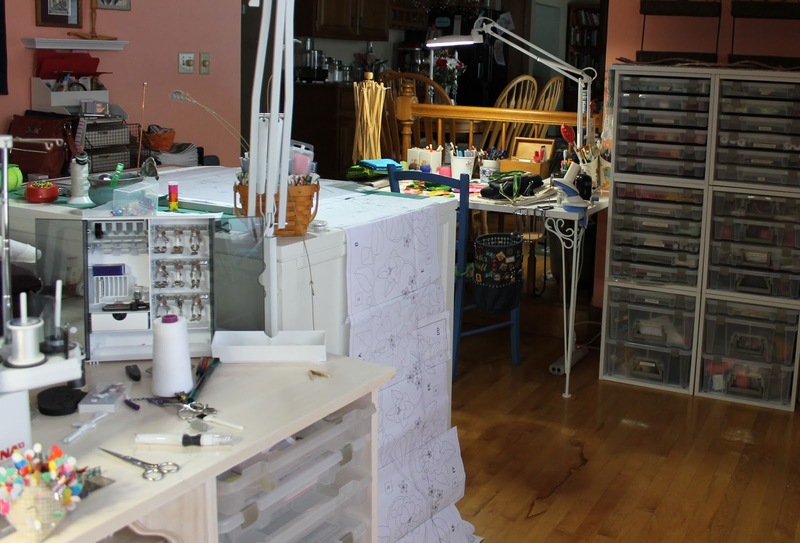 Tapestry, like quilting, requires a bit of a stash. 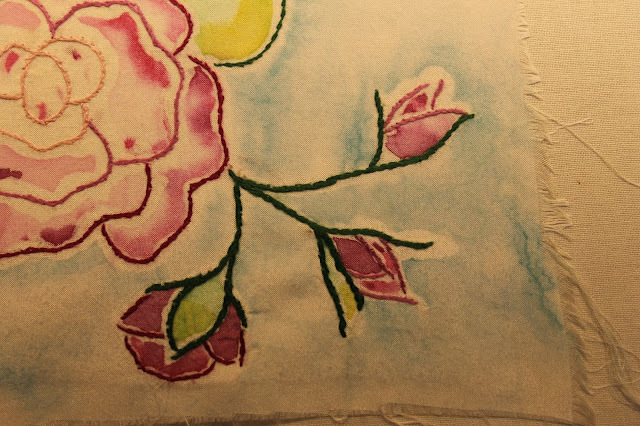 Getting a gradation of values with yarn can be even more challenging than with fabric. But there are interesting tricks. Please check out Sarah Swett's blog post on value, Go ahead, I'll wait. Really, her post is genius and so beautifully written too. I got to meet and take a workshop from Sarah almost three years ago. 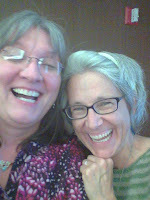 I was too new to spinning (and knew nothing about tapestry) to fully appreciate how lucky I was to spend time with her. 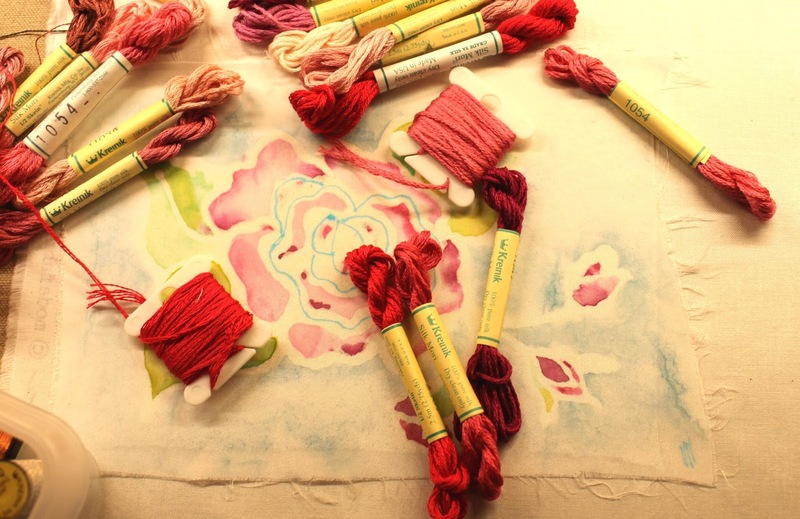 The class was on mixing colors and values in wool for spinning, but it covered so much more. 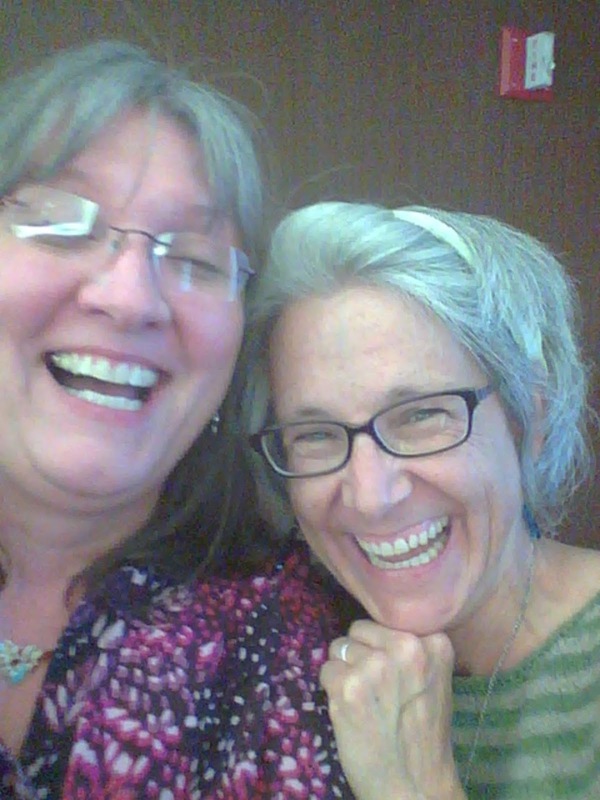 This was my first ever selfie, taken with Sarah at the workshop. The class was very meaningful to me, in a lot of ways. I was wrestling with the decision to curtail my teaching travel and dealing with creative burn out. I learned a lot in a few days, and about way more than how to blend wool. 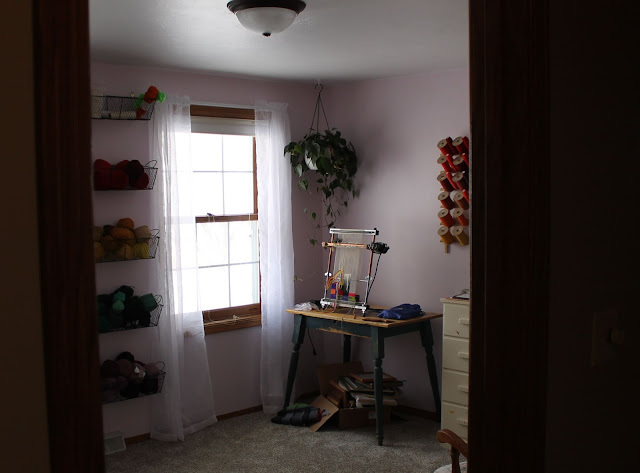 When deciding how to set up a room I often start by checking out what will be seen first. Does anyone else do that? I consider what little vignette will be seen when passing by the door. I'd like it to be intriguing, welcoming, to pull us into the room and then see that there is more to discover. 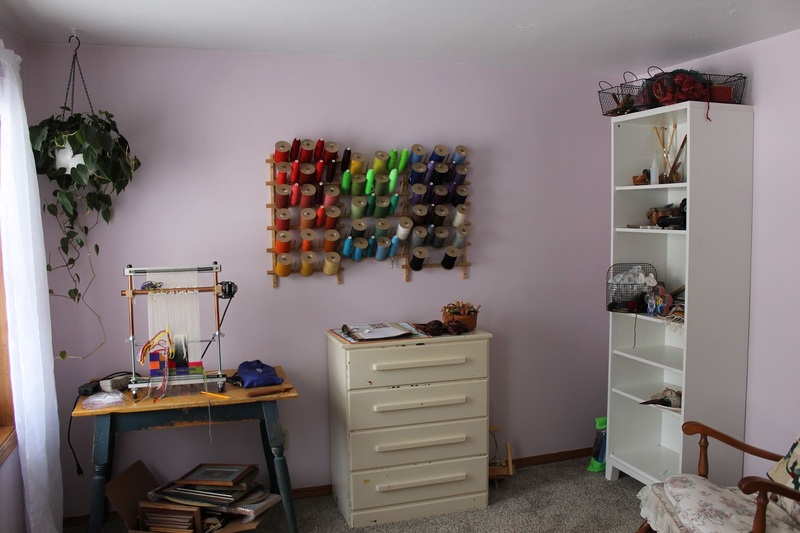 There's more to do, clearly, but setting up the loom room meant unpacking six more boxes. We're getting there. I'm on the fence about bringing up the floor loom, it will fill up the room fast, but I'm sure not going to use it in the basement. We're still waiting for the old house to choose its new family. 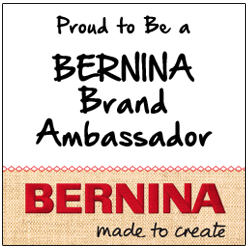 There's been a lot of interest in the last couple of weeks, we're hoping for good news soon.